Ottawa (VNA) – Local media of Canada has run many photos and articles on the two-day official visit of Canadian Prime Minister Justin Trudeau to Vietnam from November 8-9. 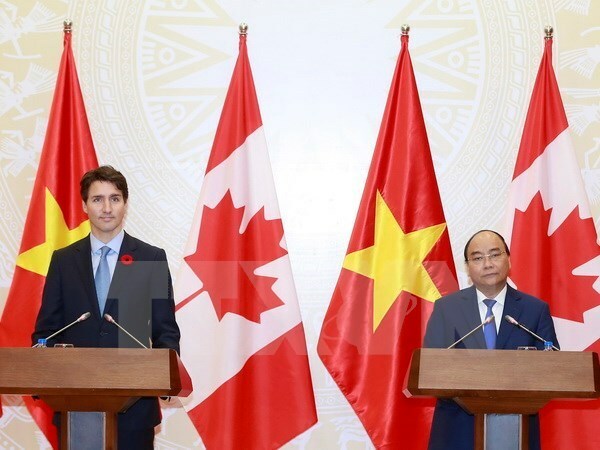 In his article on the CBC news, John Paul Tasker clarified that this is the second visit of a serving Canadian PM to Vietnam since the two countries set up their bilateral diplomatic relations, with working agenda focusing on potential cooperation areas, especially trade. He underlined Vietnam’s progress over the past decades, rising to tone of the fastest growing economies in Asia. The country also sped up free trade agreements, including the Trans-Pacific Partnership (PPP) with 11 other states. Bilateral trade between Canada and Vietnam is fairly substantial, noted the author, adding that Vietnam sent 5 billion CAD worth of goods here, much of it textiles, while Canada by comparison exported just 500 million CAD worth of products to Vietnam. Meanwhile, an article by Andy Blatchford in the Canadian Press highlighted the significance of the Asian tour of PM Trudeau in strengthening relationship with the region. The author held that for the Government and people of Canada, Vietnam is not only one of the 11 TPP negotiators and an active member of the ASEAN, but also an important trade partner of Canada in the Asia-Pacific region in which Canada is trying to increase its presence. Blatchford quoted Dominic Barton, the global managing partner of consulting giant McKinsey & Co. and head of the Trudeau government’s economic growth council as saying that Vietnam is an example of why Canada must be “motoring ahead” into Asia, particularly with so much uncertainty around the renegotiation of the North American Trade Agreement. The author also narrated opinion of Dan Ciuriak, a former deputy chief economist for what is now known as Global Affairs Canada, as he believes an updated TPP pact is closer to fruition than Canada’s potential deals with ASEAN or China. “Vietnam and Japan would be the two biggies for Canada in terms of diversifying trade,” Ciuriak is quoted. Former Quebec premier Jean Charest, who is honorary chair of the ASEAN-Canada Business Council, said Vietnam not only shows real economic potential, it also has strong people-to-people links to Canada.